Robert G. Ingersoll | Vorwärts und nicht vergessen! Robert Green Ingersoll, who became the best known advocate of freethought in 19th-century United States, was born August 11, 1833 in Dresden, New York. The son of an impoverished itinerant pastor, he later recalled his formative church experiences: „The minister asked us if we knew that we all deserved to go to hell, and we all answered ‚yes.‘ Then we were asked if we would be willing to go to hell if it was God’s will, and every little liar shouted ‚Yes!‘ “ He became an attorney by apprenticeship, and a colonel in the Civil War, fighting in the Battle of Shiloh. In 1867, Ingersoll was appointed Illinois‘ first Attorney General. His political career was cut short by his refusal to halt his controversial lectures, but he achieved national political fame for his thrilling nomination speech for James G. Blaine for president at the national convention of the Republican Party in 1876. Ingersoll was good friends with three U.S. presidents. The distinguished attorney was known and admired by most of the leading progressives and thinkers of his day. Ingersoll traveled the continent for 30 years, speaking to capacity audiences, once attracting 50,000 people to a lecture in Chicago–40,000 too many for the Exposition Center. His repertoire included 3 to 4-hour lectures on Shakespeare, Voltaire and Burns, but the largest crowds turned out to hear him denounce the bible and religion. Ingersoll’s speaking fees ranged as high as $7,000, in an era of low wages and no income tax. He married Eva Parker Ingersoll, a rationalist whom he deemed a „Woman Without Superstition,“ in dedicating his first freethought book to her. He initially settled in Peoria, Illinois, then in Washington, D.C., where he successfully defended falsely accused men in the „Star Route“ scandal, the most famous political trial of the 19th century. The family later relocated to New York. A devoted family man, he lived with his extended family, and the Ingersoll „at homes“ were celebrated, both in Washington D.C., and in New York. Religious rumors against Ingersoll abounded. One had it that Ingersoll’s son was a drunkard who more than once had to be carried away from the table. 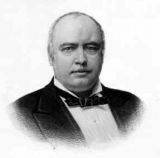 Ingersoll wrote: „It is not true that intoxicating beverages are served at my table. It is not true that my son ever was drunk. It is not true that he had to be carried away from the table. Besides, I have no son!“ The 12-volume Dresden Edition of his lectures, poetry and interviews was collected after his death and has been reprinted many times. D. 1899. — Robert G. Ingersoll. For more information on Ingersoll, read American Infidel by Orvin Larson. “Christ, according to the faith, is the second person in the Trinity, the Father being the first and the Holy Ghost the third. Each of these persons is God. Christ is his own father and his own son. The Holy Ghost is neither father nor son, but both. The son was begotten by the father, but existed before he was begotten–just the same before as after. . . .
“So, it is declared that the Father is God, and the Son God, and the Holy Ghost God, and that these three Gods make one God. “According to the celestial multiplication table, once one is three, and three times one is one, and according to heavenly subtraction, if we take two from three, three are left. The addition is equally peculiar, if we add two to one, we have but one. . . .
— Robert G. Ingersoll (1833-1899), „The Trinity“ (from „The Foundations of Faith,“ The Works of Ingersoll). The Trinity“ has been set to music by Dan Barker („Friendly Neighborhood Atheist“ CD). Long before Christ was born the Sun-God triumphed over the powers of Darkness. About the time that we call Christmas the days begin perceptibly to lengthen. Our barbarian ancestors were worshippers of the sun, and they celebrated his victory over the hosts of night. Such a festival was natural and beautiful. The most natural of all religions is the worship of the sun. Christianity adopted this festival. It borrowed from the Pagans the best it has. I think it was Heinrich Heine who said that he thought a blaspheming Frenchman was a more pleasant object to God than a praying Englishman. We take our joys too sadly. I am in favor of all the good days–the more the better. Nice work buddy! Some of these are classics! Thanks for the great ideas in this post! I’m glad to see that I’m doing several things right. I hadn’t thought about putting an interactive question in a post – nice tip. I’m pretty new at blogging and your site helped encourage me to get into some group writing contests, projects and carnivals – which I have thoroughly enjoyed! I can always count on your blog for some great ideas for taking things up a notch. It will be fun to think of some ideas for non-family related universal post topics. Thanks for such an informative post! Brilliant web-site, where did you obtain the template? Good day everyone, could anybody assist please. For what reason won’t the links on the top menu of the site web page that post a message work for me?